June 2016 | JACQSOWHAT: Food. Travel. Lifestyle. Introducing Hong Kong's latest food trend 'Steam-potting' where ingredients are freshly steamed using high-speed steaming technology. Nestled in Serangoon Gardens, Steam Box is a brand-new steam hot pot specialist, embracing high-speed steaming. Savour a wide variety the healthy way, all dishes take two to six minutes to be cooked. Torimaru is the latest brand that hits Ramen Champion, serving collagen-packed creamy chicken ramen also widely known as Tori Paitan Ramen. Competing against the other 6 brands where Tonkotsu Ramen is gaining the most popularity, Torimaru comes in differently with the highlight of their collagen broth. Adding on the list of characters themed cafe such as Pompompurin and Pokemon, Singapore's very own Hello Kitty cafe is now situated at Changi Airport Terminal 3. The Hello Kitty Orchid Garden is not only Singapore's first themed cafe starring the iconic feline, but also the world's first 24-hour Hello Kitty cafe. Spent one of my Sunday indulging in Crystal Jade's weekend brunch with the family. This brunch is a promotion in celebration of the upcoming Father's Day, this affair features a 10-course meal. To make things sweeter, you have the option to enjoy free flow exquisite Veuve Clicquot Yellow Label champagne. Finally back on travelogues because times like this I miss traveling so here is my recent trip to Melbourne, also my first time to Australia. Bought my air ticket at a relatively good rate, S$770 from Qantas sale which includes 3 ways - Singapore to Melbourne, to Sydney and back to Sg. From 30th Dec to 12th Jan 2016, it's summer time. I'm pretty sure this place is no stranger to many Singaporeans, On Lok Yun is a traditional eatery that has been around for more than 80 years. It is situated in the vicinity of Bangkok's Chinatown, serving traditional breakfast fare with a twist of Thai-style American. It's my second visit here and still loving their fluffy toast and kaya jam. 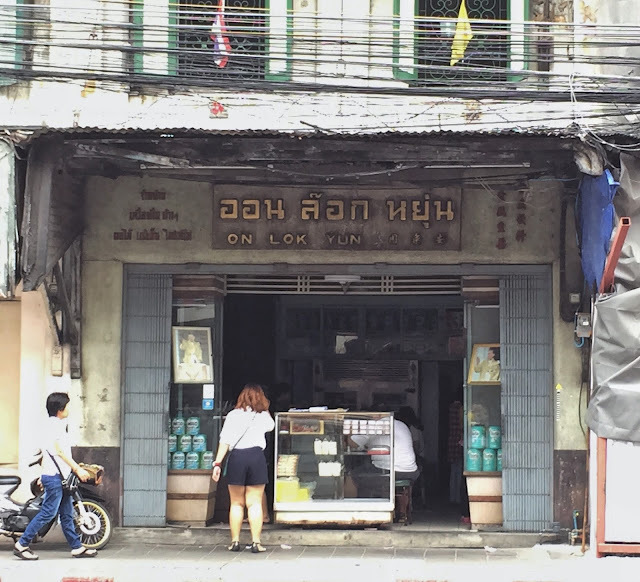 This traditional establishment reminds of our local eatery, Chin Mee Chin confectionery. Everything here is old and conventional, even the cabinets and tables. We stayed at Pratunum area during our trip and we uber to On Lok Yun for less than 80 baht. I arrived at 10am on both my visits and was pleasantly surprise to find no crowd in this charm. Most of their customers are usually tourist so having an English menu is rather essential. The menu is pretty extensive for a typical traditional breakfast which includes toast, eggs and coffee. With description and prices all written on the menu sheet, ordering process at On Lok Yun is quick and easy. What's breakfast in Thailand without having their cha yen right! This Iced Cha Yen (Milk Tea) 25฿ is rich and packed with flavour. If I could use a local term, I would say it's really 'gao'. We actually ordered all the different toast on the menu except the one with strawberry jam which we finds it pretty normal. All the toast were really soft and fluffy while still retain that crispiness on the edges. The one I adore most is the bread with condensed milk! At 27฿, this sweet dish is my kind of breakfast. The French Toast comes in 2 sizes, the small and large at 35฿ and 70฿ respectively. We had the small one that is deep fried in a pool of egg, it was oily and felt like we were having omelette with bread stuffed instead. The Kaya Bread 28฿ was one of the highlight for me too. The homemade egg custard (kaya) was fragrant and sweet, best when dipped with the plain buns. We also had the biggest all day breakfast 95฿ plate which comes with 2 eggs, bacon, ham, sausages and lup cheong (Chinese sausage). On Lok Yun is a classic spot to start your first meal, serving inexpensive traditional breakfast fare. This gem now is usually filled with tourists and sometimes a couple of older Thai folks where they leisurely sip their coffee here. Moreover, it's rare to see such tradition dining places these days. Fans of the popular K drama, Descendants of the Sun would have known that Seorae, Korea's charcoal barbecue concept restaurant is featured in one of the scene. Now that it has arrived on our shores, Seorae Singapore brings their signature galmaegisal, also known as pork skirt meat to locals to enjoy. And now besides Seoul and Busan, the popular Korean bbq chain has a presence in major cities such as Beijing, Tokyo, Hong Kong etc.